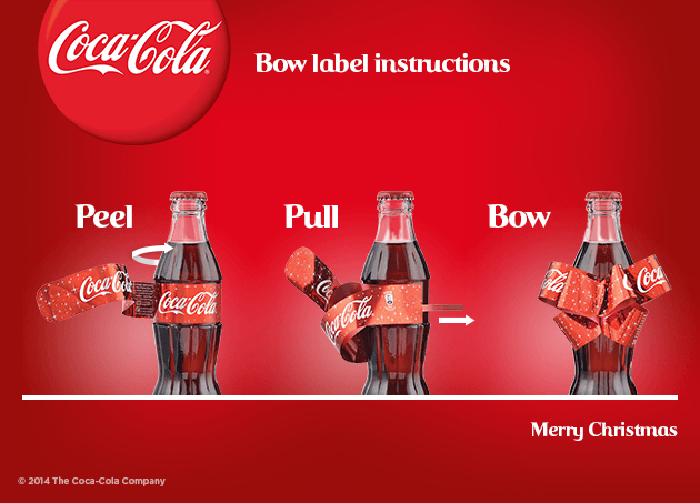 Just in time for the holidays, Coca-cola launched a limited edition bottle in which its label turns into a festive bow. How does Coca-Cola take what looks like a ordinary label and transform it into a ribbon, you ask? Two layers of printed laminated foil are heat sealed together in a unique way; the seals are angled and repeated alternately throughout the entire label. In between these labels lies an entrapped string. Once that string is pulled from one end, the two layers begin to fold into each other. Because of the seal pattern they fold in such a manner that a ribbon forms. Considering what Coke had to do to launch this innovation, my best guess would be that they used an existing bottling line for their classic glass bottles. If their label applicator already applied a similar type of label to the bottles then minimal adjustments were made to incorporate the new feature. When it comes to gaining shelf appeal under a tight budget, this is a perfect example of a brand creating buzz without breaking the bank. This is a cost effective solution that offers an element of surprise in an unforgettable way. Watch the unveiling presentation below!